This CD presents works that are new to me (with one exception, see below). I am not ‘acquaint’ with John McLeod’s music, but listeners and reviewers must start somewhere. This creative disc is an excellent place to begin. John McLeod, who is now 84 years old, is well served by his website. All biographical details can be found there. Nevertheless, a few pointers may help. McLeod was born in Aberdeen on 8 March 1934. He studied at the Royal Academy of Music in 1957-1961: composition classes were with the urbane Lennox Berkeley and clarinet with Jack Brymer, Reginald Kell and Gervase de Peyer. After leaving the RAM, McLeod had lessons in conducting from Sir Adrian Boult. His musical style was considerably influenced by the Polish composer, Witold Lutosławski. McLeod’s career has spanned conducting, performance, academic posts and, clearly, composition. His compositional mood could be described as eclectic. This is not to say that he writes pastiche or parodies. His style is quite simply indescribable. Largely modernistic in sound, his music is approachable and (typically) satisfying. At present, he seems to be represented on about nine CDs. According to his Web page, more are planned. Chronologically speaking, The Shostakovich Connection is the earliest work on this CD. It was premiered in the City Hall, Glasgow on 12 December 1974: ‘I know for I was there…’ If I am honest, I cannot quite recall what I made of this piece some 44 years ago. The work was commissioned by the Glasgow Orchestral Society, who performed it at that concert. It was conducted by the composer. Other works included Strauss’s Four Last Songs, Brahms’s Second Symphony and Elgar’s Introduction and Allegro for strings. The form of the Connection is a set of variations on two themes. The first of these is from slow movement of Shostakovich’s well-known Symphony No. 5; the second is a 12-note theme from the beginning of the 12th String Quartet. With this, McLeod balances two different compositional techniques. The variations are notated precisely, whereas the interludes in-between are influenced by Lutoslawski’s controlled improvisation as used in his Concerto for Orchestra dating from the 1950s. The overall impact of the Connection has been likened to theme music for a gripping Cold War spy thriller. This is unfair. After 44 years, I have discovered that this work combines interest with adventure and is challenging to the listener without being difficult. Anyone who expects John McCleod’s Hebridean Dances to be ‘shortbread tin music’ will be sorely disappointed. Despite showcasing the composer’s lighter side, these five arrangements reveal skill, interest, humour and depth. They were commissioned by the Scottish Chamber Orchestra and first heard at the Usher Hall on 15 December 1982. These dances are really variations on the folk-tunes and not just straightforward arrangements or transcriptions. The five movements are Going West, Dance to your shadow, The Harp of Dunvegan, the Barra Love Lilt and finally The Cockle Gatherer. What most impressed me about these dances was the colourful and effective orchestration. I guess that they could be a suite from an unwritten latter-day Ealing Comedy like a successor to the unforgettable Whisky Galore and Rockets Galore. A pleasure to listen to. The Percussion Concerto is by far the longest work on this CD, running to some 27 minutes. It was composed in 1987 for the present soloist Dame Evelyn Glennie. The work is conceived in five movements: Cortege with Fanfares, Scherzo I, Nightscape (Callanish), Scherzo II and Aubade with Fanfares. The Concerto could be defined as a homage to Bartok with its inverted arch form and central night-music section reminiscent of the Hungarian composer’s Fourth String Quartet (and other works). The score calls for a vast array of percussion instruments, including the timps, side drum, cymbal, marimba, temple blocks, tom toms, cow bells, mark tree, chinese cymbals, vibraphone, crotales and gongs. It is an impressive range that requires sheer virtuosity in performance. The highlight of this Concerto (for me) is the haunting Nightscape. This music is an evocation of the Stone Circle at Callanish on the Isle of Lewis. It is a perfect fusion of percussion, French horn and strings creating a wonderful sense of stasis and timelessness that is both moving and impressive. There is exciting music in the two scherzos and the work concludes with a Messiaenic (or is it Ravelian) ‘dawn chorus’ which builds up into a whopping climax. The liner notes explain that like the Connection, this concerto introduces controlled improvisation. Despite all this interesting and fascinating music, I am not convinced about the Percussion Concerto. I have listened to this work right through twice in preparing this review. I guess I just do not quite get it. I know not why. 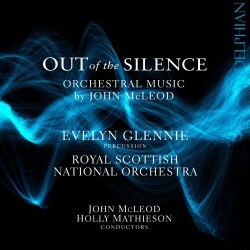 Out of the Silence is the most recent work on this CD. This was another Scottish Chamber Orchestra commission, premiered in 2015. This time, McLeod is celebrating the works of the Danish composer Carl Nielsen. The liner notes suggest that he felt a great empathy with Nielsen: ‘both composers resist[ed] easy classification in this or that “-ism”’. The work is really a conversation or debate between the two men. Chunks of Nielsen’s music are heard, including extracts from his Fourth Symphony and the Clarinet Concerto. The resultant work is not quite a cut and paste exercise, but McLeod does seem to use a fair number of quotes. Nielsen experts (I am not one!) will be able to work out exactly what is quoted and how it has been changed or reworked. The music is written in a double arch form, opening with a single ‘ting’ of a Tibetan bell and concluding with nothing more than the clacking of the piccolo’s keys. I did enjoy this work immensely and felt that the idea of a conversation was inspired. In less-sensitive hands than McLeod’s this approach could be in danger of becoming a medley or ‘a string of pearls’ of another composer’s music. Stephen Pettit’s liner notes are detailed and deserve to be read before approaching these works. There is a short notice about the composer (which does not include his date of birth) and extensive programme notes. The booklet includes the usual information about soloists and the Royal Scottish National Orchestra, including a complete list of the players. The sound was impressive and Evelyn Glennie’s performance in the Percussion Concerto is both exciting and breath-taking. I certainly would like to hear more of John McLeod’s music. Based on this CD, it is imaginative, interesting and always highly approachable. His style of modernism demands attention, is challenging, but never insists that the listener put aside their inherent love of ‘sweet airs, that give delight and hurt not’. One last thought. John McLeod allegedly had a cull of his early works. It does seem a pity that two symphonies have disappeared from the repertoire. Maybe they are not as lost as the composer may have wished. It would be good to have a CD or two featuring a Scottish symphonist: there are plenty of these folk about, but precious few recordings of their works.